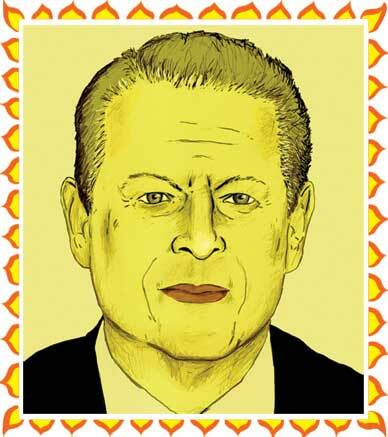 In Our Choice, Al Gore explains what must be done. But is there the political will to do it? Al Gore’s An Inconvenient Truth was one of the high points not only of the environmental movement but also of the documentary tradition in America. He figured out how to use a new medium, PowerPoint, to take the unavoidably wonkish story of global warming and make it scary, credible and manageable. It was, perhaps, as important as anything he could have done as president, and he deserved not only the Oscar but also the Nobel. As almost everyone noted at the time, however, there was one problem with the film: the section on what to actually do about the biggest problem we’ve ever faced was remarkably short, both in duration and on plausible ideas. If the world is coming to an end, changing your light bulb doesn’t seem like the obvious response. Or rather, it seems highly obvious but highly insufficient–a gesture, not a solution. Gore heard those criticisms and spent the next few years convening a series of more than thirty "Solutions Summits" in Nashville and elsewhere, where he picked the brains of virtually everyone who ever thought professionally about climate and energy. He’s taken all those data and all those ideas, and with the help of a capable team of researchers he’s turned them into a book, Our Choice, an ambitious and entirely successful attempt to lay out all that we know about mainstream answers to global warming. (When I say "virtually everyone," I mean it; the acknowledgments take up four pages of agate type and include even me.) He’s got chapters on solar electricity, on wind energy, on biofuels, on nuclear power and even on more recondite topics: geothermal energy, carbon sequestration. Taken as a whole, however, this is the most comprehensive and well-informed survey anyone has ever done of what we need to do to get off fossil fuel. Gore is judicious and reasoned at every turn, and gets most of the calls exactly right. Building more traditional nuclear power plants will be too expensive to provide much help. Ditto carbon sequestration: it’s a good idea to try and take the exhaust from coal-fired power plants and store it underground in old oil wells, but the costs so far seem prohibitive. In fact, to many of these dilemmas Gore applies a wise test: "Put a high price on carbon. When the reality of the need to sharply reduce CO2 emissions is integrated into all market calculations–including the decisions by utilities and their investors–market forces will drive us quickly toward the answers we need." Gore, I think, has reasonably answered not only the one apt criticism of An Inconvenient Truth but also the good-faith (as opposed to talk-radio) objections of anyone wondering if the world really could exist without fossil fuels. The answer is, not easily, but it’s well within the realm of technical possibility. If we followed his advice, we’d make it. What’s lacking, of course, is the political will to really do it. And if there’s one weakness this time around, it’s that Gore could have devoted a little space to figuring out how we should build that political will. If we’re going to impose a price on carbon at the Copenhagen conference, or pass a strong renewables target in Congress, or do any of the dozen or so other things the situation desperately demands, reasoned argument among experts alone will not carry the day. In fact, it won’t come close. We’ve known, more or less, what to do for more than a decade, but any progress has been stymied, especially in this country, by the well-funded deniers propped up by the coal and oil industries, and by the pliant and gullible media that continue to give them play. Simply adding a few thousand more tons of scientific reports to the environmental side of the scale won’t tip the debate, not when Exxon can afford to buy the necessary coterie of Congress members. The only thing that will suffice is to build a movement strong enough in some other currency (bodies in the street, votes in the ballot box) to provide serious counterpressure. Of course, it is not Gore’s job to provide this pressure (and, in any event, his Alliance for Climate Protection has been a useful attempt to build some). The guy’s not responsible for coming up with absolutely every answer to every part of this problem–and the good news, in the past few months, is that many others are stepping into this realm. I’ve been watching climate policy closely for twenty years, and only now does the planet’s immune system seem to be kicking in: civil society has finally recognized global warming for the overarching threat it is, and has begun to go to work. The parts I’ve gotten to watch most closely have been the international efforts. In the past eighteen months, my fellow activists and I have built 350.org, the first real global grassroots climate change campaign, which peaked on October 24 with a global day of action. That day featured thousands upon thousands of events in more than 150 countries–it may have been the most geographically widespread day of political action the planet has ever seen. (And it was almost certainly the only one devoted to a point of scientific fact: 350 parts per million carbon dioxide is what scientists now tell us is the most the earth’s atmosphere can safely hold, at least if we want a planet "similar to that on which civilization developed and to which life on earth is adapted.") It was, truth be told, quite amazing fun to watch the campaign come together–young people around the world, clergy, scientists all dreaming up powerful ways to take those three digits, arguably the most important number in the world, and make them the most well-known. There were underwater cabinet meetings (in the Maldives, led by President Mohamed Nasheed, whose nation may not exist in a hundred years) and climbers on the melting slopes of the world’s highest peaks. There were thousands of churches ringing their bells 350 times and giant actions in major cities where people formed 3s and 5s and 0s with their bodies, a kind of planet-scale Scrabble. It began in New Zealand and went around the world till sunset in Hawaii–and since it was tied not to a slogan but to a specific demand, it may help move the Copenhagen talks at least a little in the direction of the science. But this kind of movement will need to continue and grow. We’ll need civil disobedience, of the kind that blockaded Congress’s coal-fired power plant last spring; we’ll need symbolic witness, like 350.org; we’ll need old-fashioned lobbying. We also learned a lot of lessons about organizing globally, something that wasn’t really possible even a few years ago. The power of the Internet is less in the gee-whiz stuff Gore describes (real-time pictures of the earth so that everyone can see its fragile beauty) but in the ability to use it, à la the Obama campaign in 2008, as a tool to enable events in the real world. At 350.org we’re running a website with fourteen languages and using wordless animated videos; our sense is that it’s possible for the idea of a "global movement" to be something more than pious rhetoric. On this toughest of all issues we were able to find millions of people on both sides of the rich-poor divide who understood that they have a great deal in common, beginning with the shared awareness that nowhere on the planet is safe once we’re north of 350 ppm. It’s moving–humbling, really–when someone sends you pictures from their rally in Cameroon or Burundi or Quito or Phnom Penh. Humbling because you know they did nothing to cause the problem but have come to realize that in a world newly wired together, they might be able to play some real role in solving it. Gore ends his book with a lovely speech from the future, looking back on what was accomplished after "the turning point came in 2009" with "the inauguration of a new president in the United States." Former opponents, impressed with the president’s sincerity and moved by the questions of their children, began to link arms in the struggle for a clean-energy future, and soon the right incentives were unleashed, new technology began to pour off the line, even passenger rail surged again across the land. "Although leadership came from many countries, once the United States finally awakened to its responsibilities, it reestablished the moral authority the world had come to expect from the U.S. during the 40 years after World War II." That’s a very pleasant dream, especially for someone like Gore, who was a firsthand witness to the period of American leadership he describes. But as he knows as well as anyone, at the moment it’s nothing more than a dream. Making it real will depend on how hard we push the system. There’s no question it’s capable of responding, and no question that left to its own devices it won’t.